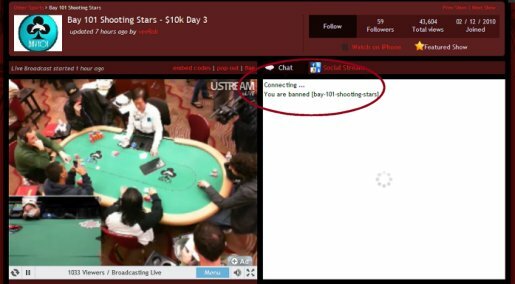 Folks, PokaPaloma has been banned from the “chat” portion of the live stream of the Bay 101. Hummm. Afraid of success maybe? Compared to the embarrassing crap that I saw “people” – and I use that term lightly – exchanging like their racial prejudices, use of the “N” word, ridiculing overweight and “plain” looking dealers, discussing the dealers’ and female players “racks”, making fun of Maria Ho’s last name, debating just how cute Jen Harman is… and so on. And then there were the jokers masquerading as Marc Seif, Mike Matusow, DaveWilliams, etc. And then there were the unappreciative SOBs who complained about a blurry image, the sound disappearing for a few minutes, a “wrong” angle at a table… and so on and so on. veeRob, Kevinmath and Matt…You re-Tweeted my tweets promoting the live stream and now you ban me? Funny that I used the word connected. I feel that I know them better because I have been following their tweets for several months. I’ve even written about the good, the bad and the ugly tweeters in the poker world in Following Poker Pros on Twitter. You come to know who is family-centric, party-centric, into living life to its fullest, into whining and/or beating up on themselves, etc. In following the Poker Pros, you can’t help but come across scores of reporters who tweet about them. Lots report on busts, chip counts, and levels. Great information when you are following a tournament. One reporter that stands out from the crowd and one of my personal favorites is –> BJ Nemeth of Atlanta Georgia. BJ Nemeth is a photographer for the PokerRoad Photo Blog. BJ tweets about current stats AND the general events surrounding the 2009 WSOP. I took notice of BJ the week before the 2009 WSOP began when he photo-journaled his drive from Atlanta to Las Vegas on Twitter. Seemed like every couple of hours there would be a tweet from BJ re: his progress. Tweets were short; photos spoke a thousand words. On Memorial Day, BJ stopped in Oklahoma City and shared photos of the memorial. (Very appropriate – Thanks, BJ.) BJ went something like 37 hours without sleep, tweeting and photo taking along the way. If you are a visual person like myself and want to be up close and personal at the 2009 WSOP, start following BJ Nemeth [@BJNemeth] on Twitter. What about you? Who are you following? Who’s your favorite 2009 WSOP reporter?